Join tens of thousands of happy users, and try Bluetooth Streamer Pro for free today!!! Trying to stream music to your Bluetooth car stereo, hearing aid, or headset??? Looking for an inexpensive and wireless alternative to auxiliary cables or expensive aftermarket hardware??? Look no further!!! 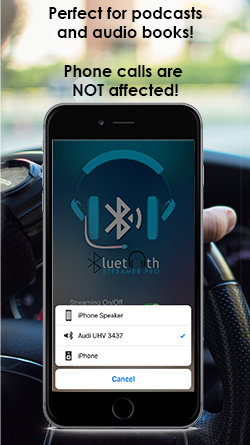 Stream ANY audio from your phone to your car stereo, hearing aid, or headset wirelessly, even if it only allows you to make phone calls now!!! Does your vehicle have Bluetooth for making phone calls (hands-free), but it won’t let you stream your music and audio files??? Mine does, and I searched high and low for a solution. The best option I found was to buy an expensive piece of hardware to perform the A2DP Bluetooth profile my car stereo was missing. That hardware finally allowed me to stream the audio and feed it into the auxiliary port. 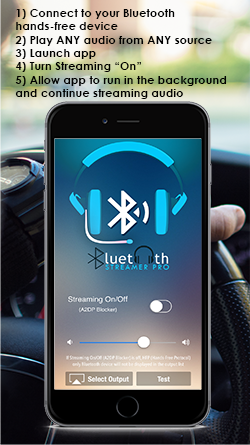 That is a great option if you want to spend $100+ on the hardware, but I thought there had to be a better way… If that doesn’t sound appealing to you, there is finally an affordable option…the Bluetooth Streamer Pro app!!! This app makes the car stereo (or any device that supports Bluetooth Hands-Free Protocol, HFP) think it is on a phone call and stream the music/audio that way!!! Works especially well for podcasts and audiobooks such as Audible and Scribd!!! 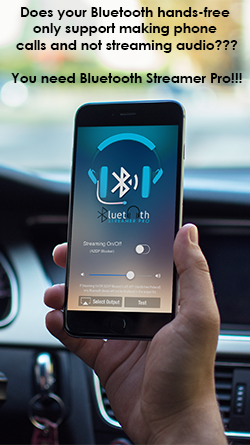 Most brand new automobiles that have Bluetooth are able to stream stereo music via A2DP protocol and make phone calls via HFP protocol. This app will not help you much with these vehicles. However, vehicles just a few years old that have Bluetooth installed from the factory only have HFP protocol, so they can only make phone calls via Bluetooth. There are also several new and older headsets and hearing aids that only have HFP Bluetooth. If you have one of these vehicles, headsets, or hearing aids and want to stream audio, this app is for you!!! This is not a comprehensive list (nor does it ensure it will work, please test on your equipment during the trial period), but many late model vehicles made by Acura, General Motors with Onstar, and Audi MMI would benefit from this app. Headsets that may benefit include several Samsung, BlueAnt, and Plantronics models. Hearing aids that may benefit may include several Unitron and Phonak models. Again, please test on your own equipment during the free trial period to verify correct operation. IMPORTANT NOTE: The audio is streamed to the car stereo (or other HFP device) through a protocol normally used for voice (phone calls). Therefore, the audio frequency range output will not be the same as using A2DP protocol. This is a limitation of the hardware/protocol and NOT the app. The only way to change this is to buy different (and expensive!) hardware. Please test and make sure you are satisfied before you purchase. We want you to love it, and we are sure you will!!! Does your vehicle have Bluetooth for making phone calls (hands-free), but it won’t let you stream your music and audio files??? Mine does, and I searched high and low for a solution. The best option I found was to buy an expensive piece of hardware to perform the A2DP Bluetooth profile my car stereo was missing. That hardware finally allowed me to stream the audio and feed it into the auxiliary port. 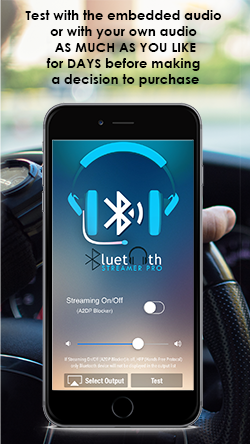 That is a great option if you want to spend $100+ on the hardware, but I thought there had to be a better way… If that doesn’t sound appealing to you, there is finally an affordable option…the Bluetooth Streamer Pro app!!! This app makes the car stereo (or any device that supports Bluetooth Hands-Free Protocol, HFP) think it is on a phone call and stream the music/audio that way!! !